I’d be lying if I said today was like skipping through a field of bluebells. I’ve felt oddly flat for no reason, with everything filed in the ‘too hard’ basket. But there were some good things. The East Sussex and Kent countryside out of the train window up to London looked spectacularly beautiful now it has turned properly to autumn. I spent the really annoying one hour I have at home between the fifteen minute journeys to and from my daughter’s gym training watching the new series of Obsessive Compulsive Cleaners. It’s a show where people with OCD cleaning compulsion go and clear out of filthy crammed the houses of hoarders, or just plain slobs. Thus combining two of my previous favourite shows – How Clean Is Your House? and Life Laundry – into one. I’m so fascinated by these shows, I made the heroine of my book How To Break Your Own Heart a clutter clearer. And for the real joy moment of today, see below. Look away if you are offended by coarse language. 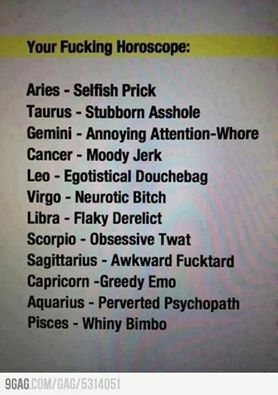 How accurate is that horoscope!